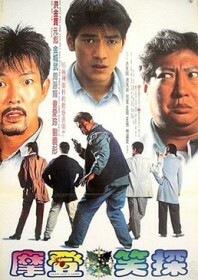 A horribly misjudged action comedy from Sammo Hung which is really quite repugnant. With his credibility on the slide in the early 90s, Sammo seemingly turned on his audience. The title says it all. It shows Sammo at his most vitriolic; it’s anti-Japanese, anti-youth culture, misogynistic, sweary (with F-words and C-bombs littered everywhere), and racist – almost proudly so. The final act sees co-stars Yuen Biao and Takeshi Kaneshiro in black face, supposedly acting as “chiggers” and employing just about every black American stereotype imaginable. It’s a sequence of such unbelievable horror that you would think we’re dealing with a film from the 1970s, and not the progressive ’90s. It conjures up the sort of unapologetic, politically incorrect and dated humour found in Sammo’s gay comedy Pantyhose Hero. This was meant as a vehicle to reunite the ‘Three Dragons’ with Jackie Chan originally cast in the Kaneshiro role, but Chan pulled out due to his commitments to Rumble in the Bronx – which may well have been one of the best decisions of his career. When Sammo’s at his best, he’s a magician; but when he’s at his worst, he’s like this.